The goal came at the midway point in the second half when Joe Jakub, being tried at left back, played a ball upfield that neither of Blackburn's central defenders, Tony Dobson and Kevin Moran, were able to collect. It left Conroy clear and, after moving forward some 30-yards, he shot under goalkeeper Bobby Mimms to give the Clarets a richly deserved equaliser. That we needed to equalise was due to another John Pender goal, his second in two home games. He'd put through his own goal in the 2-0 defeat to Bury and with just three minutes gone in this encounter he did just the same. It had been a difficult start for Burnley and both David Hamilton, the club captain, and Jakub had cut out dangerous balls before the third, a superb cross from Scott Sellars, was met by team captain PENDER who could do no more than head past Chris Pearce in the Burnley goal. Despite that, Burnley stuck at it and went toe-to-toe with Rovers in the first half although they were the better side of the two. That all changed after the break when the Clarets, much to the delight of the home crowd, were very much on top. 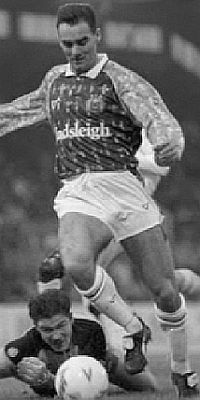 We even had to change goalkeeper when Pearce was involved in a clash with Steve Livingstone that left him unable to continue and we were almost level when Ian Measham came close to an equaliser. It followed superb work down the left by Andy Farrell and Steve Harper. The cross from Harper just eluded Conroy but Measham crashed a header against the bar before being seeing it scrambled away by the frantic visitors via the post. Then came the CONROY goal and if you want to be an instant hero at Burnley then there is no better way of doing it than scoring your first goal in your first home game and against Blackburn. It was real end to end stuff for the remainder of the game but there was no doubt Burnley thoroughly deserved this draw. Even so, with Preston having hit Bury for six on the same night it was going to take a big win at Deepdale on the plastic pitch if we were to go through to the Lancashire Manx Cup Final. Manager Frank Casper was delighted. "There were some brilliant performances out there tonight and we were full value for our draw," he said. "We viewed it as a training session and although there are still some things that need to be put right, it was a lot more useful than Saturday's game." He added: "Mike Conroy and Steve Harper are settling in well and showing what they are capable of, but there is still room for improvement and when I have got the players I want no one will be sure of a shirt." Casper confirmed that the highest priority was for a defender following the departure of Steve Davis to Barnsley and after that he would like to bring in a midfielder. It was confirmed that Burnley's opponents in the newly named Autoglass Trophy would be Blackpool and Doncaster Rovers. We would travel to Blackpool in October with Billy Bremner's Doncaster to play at Turf Moor in the following month. Burnley: Chris Pearce (David Williams), Ian Measham, Joe Jakub, John Deary, John Pender, Mark Monington, Andy Farrell (Peter Mumby), David Hamilton, John Francis, Mike Conroy, Steve Harper. Subs not used: Graham Lancashire. Blackburn: Bobby Mimms, Mark Atkins, Stuart Munro, Nicky Reid, Kevin Moran, Tony Dobson, Alan Irvine, Paul Shepstone, Steve Livingstone, Simon Garner, Scott Sellars (Jason Wilcox). Subs not used: Terry Gennoe, Keith Hill, Lenny Johnrose, Mike Duxbury.